“This is a Book which We have sent down to you, full of blessings, that you may ponder over its Verses, and that men of understanding may remember.” [Soorah Saad38:29]. 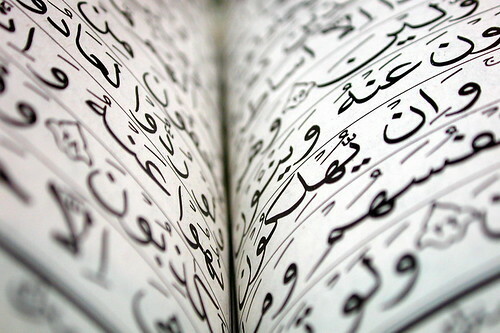 The aforementioned recitation of the Qur’aan includes both reciting and acting upon it. The recitation is to be done with contemplation and understanding of it. Sincerity to Allaah is a means of complying with and acting upon the Qur’aan, and its recitation contains a great reward – as the Prophet sallallaahu `alayhi wa sallam said: “Recite the Qur’aan. For o n the Day of Resurrection, it shall come as an intercessor for its companion.” This was recorded by Muslim in his Saheeh (no. 804). The Prophet sallallaahu `alayhi wa sallam also said: “The best of you is he who learns the Qur’aan and teaches it.” This was recorded by al-Bukhaaree in his Saheeh (9/66). Another narration states: “Whoever reads o ne harf (letter) of the Qur’aan shall receive a good deed and ten good deeds similar to it. I do not say that Alif Laam Meem is a harf, but Alif is a harf, Laam is a harf and Meem is a harf.” [Saheeh; Recorded by at-Tirmidhee (no. 2912), who authenticated it, from the hadeeth of `Abdullaah ibn Mas`ood, radhiallaahu `anhu]. The Prophet sallallaahu `alayhi wa sallam said to `Abdullaah ibn Amr ibn al-`Aas: “Complete the recitation of the Qur’aan o nce a month.” He said: I am able to do more than that. So he said: “Then complete its recital o nce in seven days.”[al-Bukhaaree (no. 5054)] The Companions used to complete the entire Qur’aan o nce every seven days. Visit http://downloadquran.iloveAllaah.com to Download Quran. Visit http://quran.iloveAllaah.com to read Quran Online.